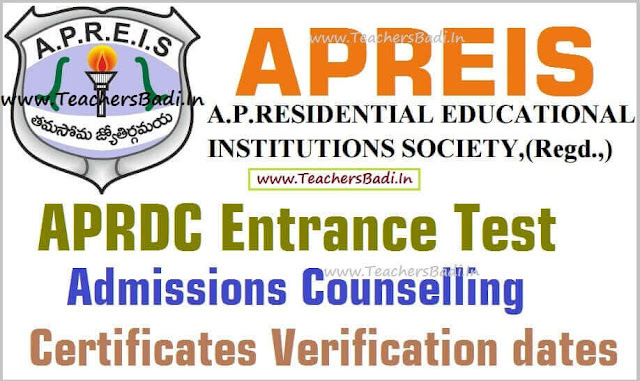 APRDC CET Admissions Counselling, Certificates Verification dates 2019 and list of Documents to be produced at the time of verification/Shortlisted candidates for 1st phase counselling: APRDC CET 2019 #Results: Andhra Pradesh Residential Educational Institutions Society(APREIS) officials issued the APRDC Common Entrance Test 2019 Notification in March 2019 and the AP Telangana REIS invited the online applications from the eligible inter passed students of Andhra Pradesh State for admissions into I year regular Degree Courses B.A. (HEP), B.Com (General), B.Sc., (Maths, Physics and Chemistry) and B.Sc. (Maths, Statistics and Computer Science) Courses in its Residential Degree Colleges in Andhra Pradesh for the academic year 2019-2019. Eligible students were applied for this stream from 15-03-2019 to 10-04-2019 and they were appeared for this entrance test stream, This RDC Entrance Test held on May 10th, 2019 in all the district head quarters in AP. This exam was conducted in three streams viz BSc, BA, BCom and all for 150 marks and the test pattern is objective type and each question carries one mark. So, the Hall ticket Numbers of the shortlisted candidates for counselling are available on the websites: http://apresidential.cgg.gov.in/indexedu3.aspx, https://aprjdc.apcfss.in/. Candidates has been shortlisted based on merit in the Entrance Test. Candidates will be called for counselling as per schedule for allotment of seats for admissions.The counselling will start from 9 AM. APREIS has decided to conduct counseling at the specified venues as per the APRJC CET schedule for admission of students into I year degree courses in A.P.R. Degree College Nagarjunasagar and Silver Jubilee Govt. Degree College, Kurnool for the academic year 2019-19. Date of Counselling for First list candidates will be ... APRDC appeared candidates can check their results at following the link. "APRDC Admissions counselling to be started from June 3, 2019, So, Eligible Short listed candidates may attend the counselling for admission into Degree courses. SRR GOvt Degree College, Vijayawada,(Andhra University and Osmania University Area)"